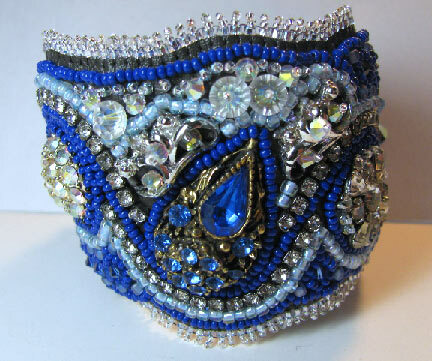 Beading Arts: "Arm Candy" is now available for download! Thanks to having a huge collection of vintage jewelry, much of it broken, I was inspired to work on a new series of jewelry pieces which integrates broken treasures more fully into my mixed media bead embroidery. What fun it was to make these pieces, and it's even more fun to wear them! The techniques section covers a dozen ways to attach your broken pieces to your beadwork. 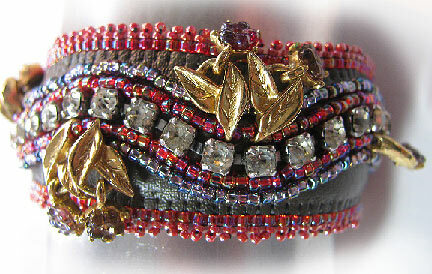 What do you do when traditional peyote stitch bezeling won't work? Try one of the other eleven ways! 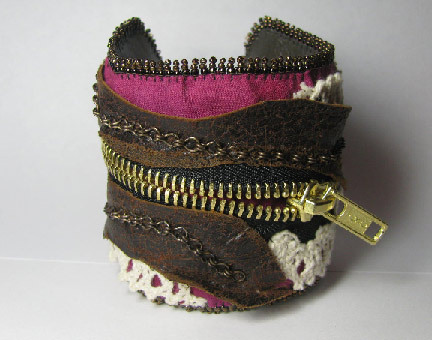 This is followed by four compete step-by-step bracelet projects, which include design tips, detailed instructions that will help it turn out right, and all you need to know to finish the back and edges of each piece professionally. My biggest personal challenge in putting this e-book together was realizing that you probably won't be able to find identical pieces to work with as the ones I have. If you read through the materials and the techniques section before you start any projects, I believe that they will help you come up with creative alternatives based upon what you may already have available. Because of this, I have refrained from giving exact bead counts and measurements, but have instead emphasized the principles of my design choices. 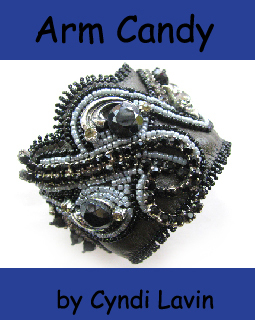 For this reason, Arm Candy is not really a beginner book, although a determined beginner will learn from the start how to make pieces that are truly her own! What a cool ebook!!! I love the black and silver...you really give us so many ideas to use all that jewelry just sitting around!!! Thanks again Cyndi!! !